Regiment/Catrawd: 33rd Battalion, Machine Gun Corps (Infantry). Service Rank and Number / Rheng gwasanaeth a rhif: Private No. 87586. 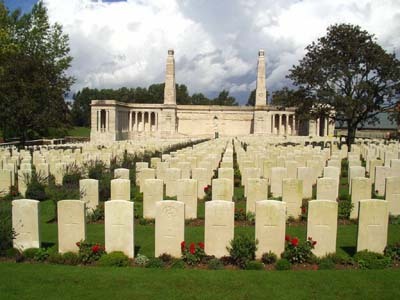 Military Cemetery/Memorial / Fynwent milwrol: Vis-en-Vis Artois Memorial, Pas de Calais. Killed in action on Wednesday 18 September 1918 during the Battle of the Somme, aged 25 years. John Lloyd was born in Pentrevoelas, Denbighshire, North Wales in 1893. The 1901 Cenus shows that the family lived at Tan y Bryn Farm, Pentrefoelas. The head of the family was Evan Lloyd aged 41, who was employed as a Farm Carter. His wife Eunice aged 35 and their five children – Evan M Lloyd aged 10, John Lloyd aged 8, Robert Lloyd aged 6, Catherine A Lloyd aged 4 and Jane Lloyd aged 1 year. On 26 December 1916, John enlisted with the Royal Welsh Fusiliers (Horse Transport Section) at the Recruitment Centre, Bangor, Caernarfonshire, North Wales. He later transferred to 10th Battalion, South Wales Borderers and on Tuesday 6 March 1917 to 33rd Machine Gun Corps. Vis-En-Artois Memorial, Pas de Calais, France. On 20 March 1919, a payment of £5. 6s. 10d. was made by the War Office to Mrs Eunice Lloyd, being monies owed to her son John. On 23 December 1919, a further payment which is recorded as a War Gratuity of £7. 10s. 0d. was also made to her. There is a Flintshire Roll of Honour Card for John Lloyd at the County Archives, Hawarden, Flintshire, which is dated 9 September 1919 and signed J. Williams.